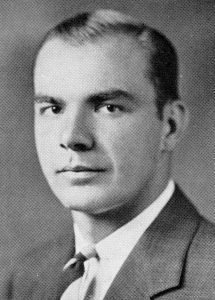 James Alexander Hutchins Jr. (1917–2002), a distinguished alumnus of the University of North Carolina, spent most of his life fighting world hunger. Hutchins came to Chapel Hill from Winston-Salem in 1933 on a tennis scholarship. When he discovered that the University did not supply racquets, and unable to afford his own during the Great Depression, he went out for football instead and excelled. As a star fullback for the Tar Heels, Hutchins was All-Southern three years in a row, made the All-Southern Conference first team in 1936, and earned an Honorable Mention by the All-American Board in 1934. Off the field, Hutchins’s faculty mentor was the illustrious sociologist (and fervent football fan) Howard Odum, pioneering scholar of southern culture, society, and race relations and founder of UNC’s Institute for Research in the Social Sciences. Stressing the importance of regionalism and social planning, Odum inspired a generation of students and social scientists with the goal of addressing the South’s numerous economic and social ills with rigorous scientific research. Hutchins earned both his B.A. and M.A. under Odum’s direction and carried his mentor’s lessons to his first job with the U.S. Department of Agriculture in 1939. Jim and Marguerite Hutchins married in 1940 and raised three children: Julia, Alex, and Glenn. Hutchins served in the U.S. Navy during World War II, and then returned to the Department of Agriculture, where he fought rural and urban hunger and helped create the nation’s first school lunch program. Hutchins met new challenges when America’s postwar farm economy shifted from scarcity to surplus. As Chief of the Direct Distribution Branch for the Department of Agriculture’s Food Distribution Service, he coordinated programs in eighty-four countries and became a founder of CARE, the global anti-poverty organization. As head of the federal government’s Commodity Credit Corporation in the 1970s, he helped stabilize and protect domestic prices and farm income, while also selling agricultural commodities to foreign markets. He later recalled, “I spent the first twenty years of my career giving away food, and the next twenty years selling it.” Jim Hutchins remained a lifelong Carolina sports fan, frequently regaling dignitaries with the Carolina Fight Song. In 1980 he and Marguerite retired to Chapel Hill. He died there in 2002; she passed away in 2016, after celebrating her 95th birthday party at CSAS. Both are buried in the Old Chapel Hill Cemetery. The Hutchins Forum and the Center’s public lecture series are named in their honor.